Where in the world did February go?! With St. Patrick’s Day right around the corner, it’s about time I replace my Valentine’s Day Banner with something a little more green! 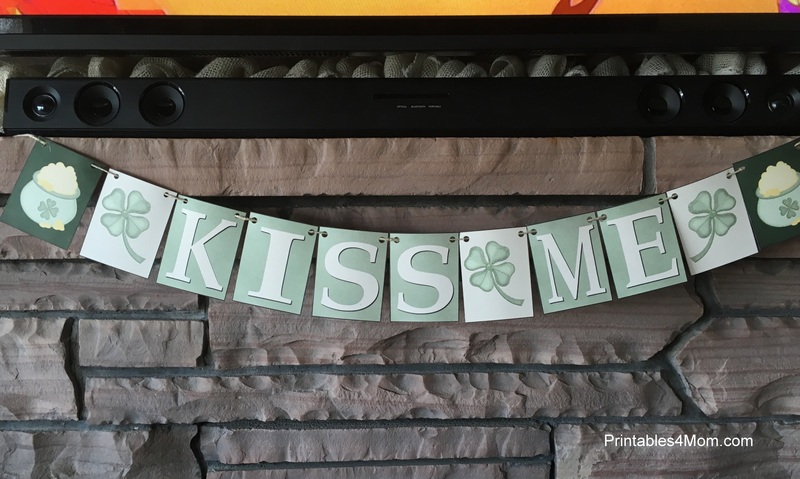 Grab the free printables to recreate this Kiss Me St. Patrick’s Day Banner. I’ve received so many compliments on my Kiss Me Banner and it’s super easy to put together! 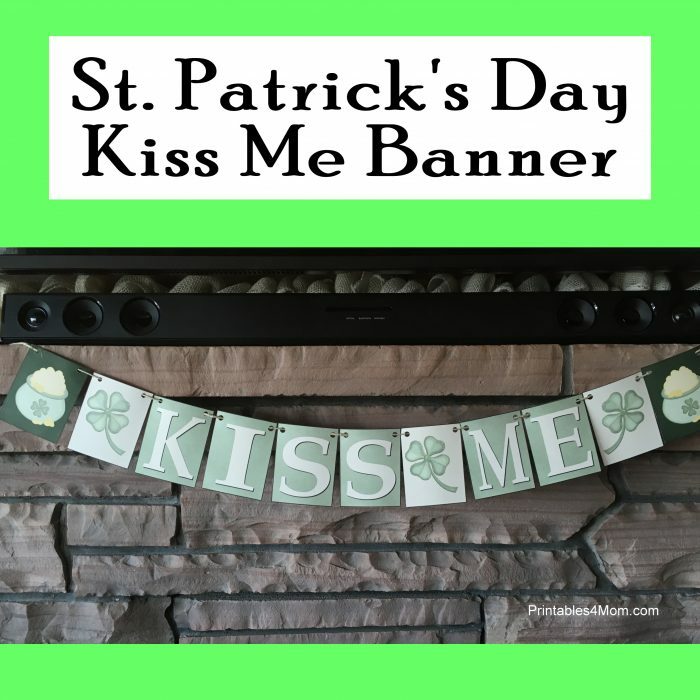 Add this Kiss Me St. Patrick’s Day Banner to your own decor with free printables! 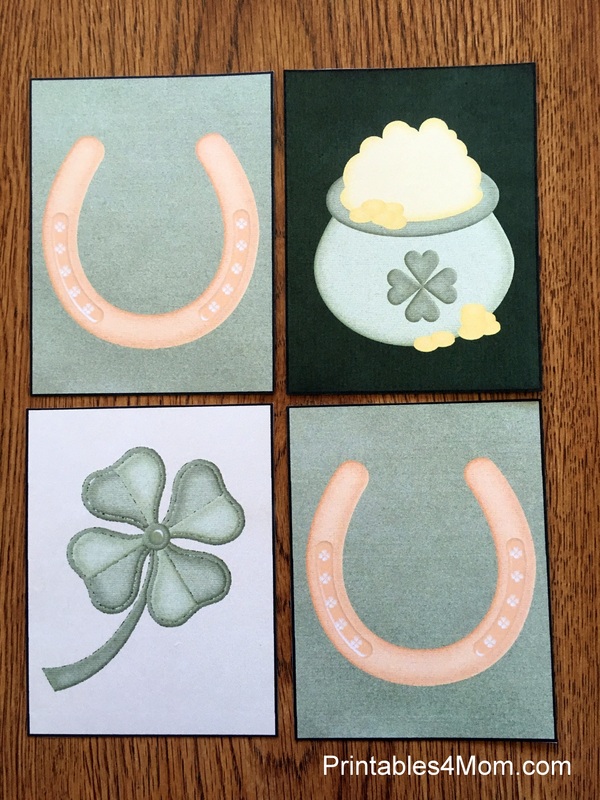 Little accent cards include the pot of gold, golden horseshoe, and 4-leaf clover. Use as many or as little of each as you want to make the banner the size you need for your space. After you have everything printed, cut out the squares and use a hole punch to punch holes in the top right and left corners of each square. When you are done, begin threading each square onto your twine to create your banner. I used “Natural Polished Hemp” twine that I picked up at our local Walmart, but you can use whatever you have on hand, including ribbon or yarn. After you’ve threaded all of your squares, simply hang your banner and enjoy! (As you can see, my daughter’s current obsession is Dora the Explorer!) 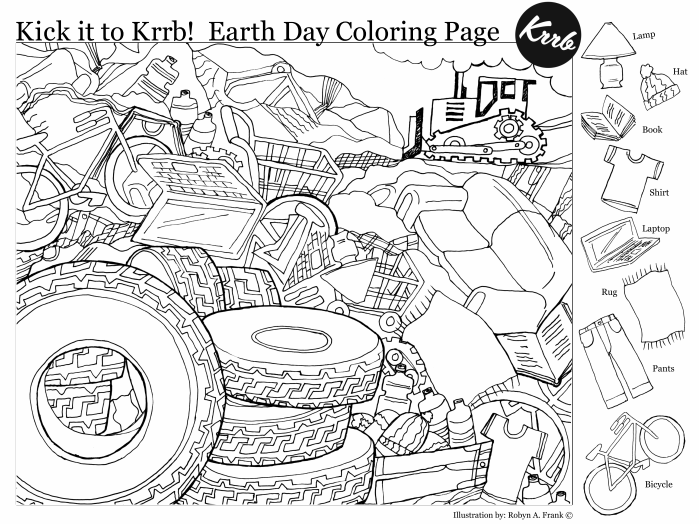 If you use our banner printables, I would love to see the finished product, so send me a photo! Looking for something a little different? 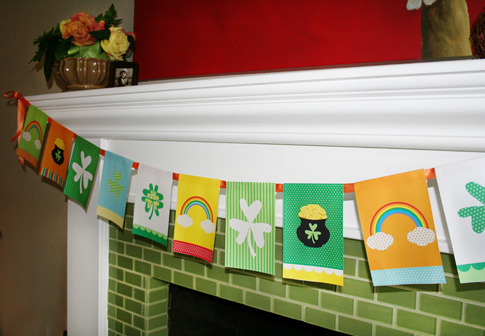 Check out our favorite St. Patrick’s Day Banners we found online! 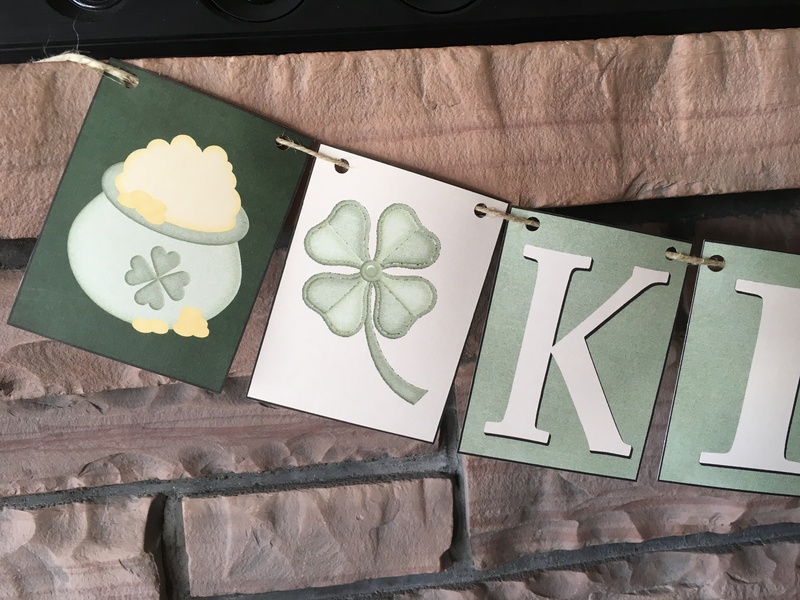 Decorate your mantel for St. Patrick’s Day with this printable banner! 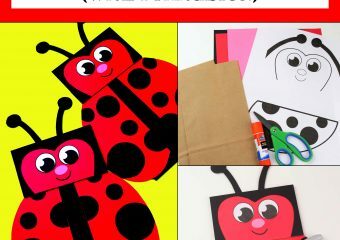 Print and create this banner from Sandy Toes and Popsicles to add some green cheer to your own home! 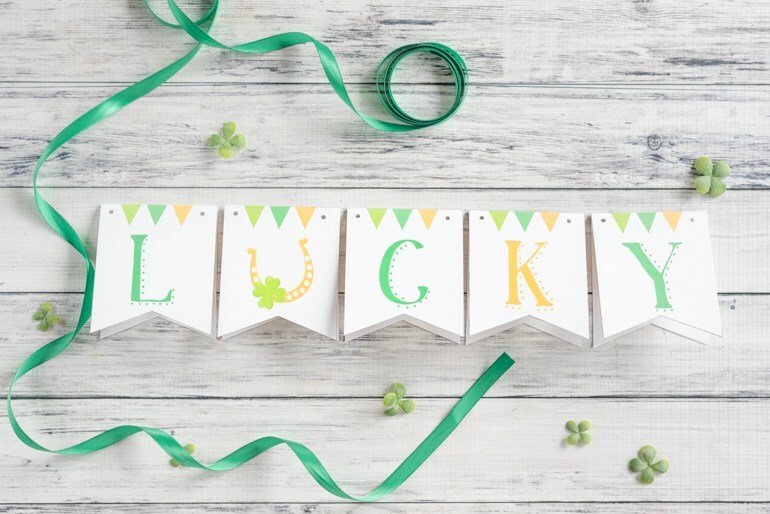 Add a little luck to your decor with this Lucky Printable Banner from The Artisan Life. As always, we’d love to see your favorite St. Patrick’s Day banners. Leave us a comment and let us know where to find them! I’m going to email you a picture because I can’t add one here, but I wanted to show you my finished banner. It turned out great and fits perfectly above my kitchen entryway! 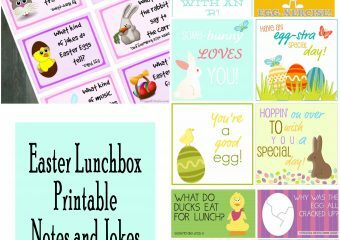 Thank you so much for all the wonderful printables.